Pellegrini questions Chelsea's staying power in the title race. Manchester City take on Crystal Palace at the Ethiad in the lunchtime kick off today knowing that three points would take them level with Chelsea before we play Stoke on Monday night. Manuel Pellegrini has given his view on Chelsea and the title race. Much has been made of the fact that Chelsea had an eight point lead over Manchester City at one stage but after a draw at Sunderland followed by defeat at Newcastle, City have closed the gap. 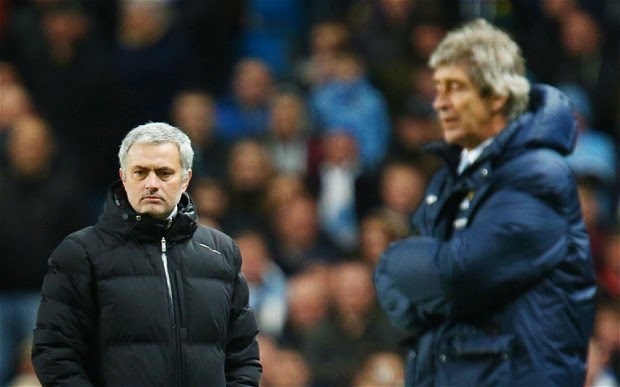 Jose Mourinho has re-iterated the fact that Chelsea are taking each game as it comes and will try to win every game but Pellegrini yesterday tried to put pressure on Mourinho's men by questioning whether or not they have the staying power. "I think Arsenal last season had a very similar number of points as Chelsea have now. So we'll see what happens in the second half of the season and how many points you need to win. Maybe Arsenal last season couldn't do it in the second half, but we don't know what Chelsea will do this year. I think that we must try and think about our team and not the others. We always believed that we could make up the points, because he had so many games to play. You never win a title in December. Maybe you can be the best team and winning all the games, but you don't know what will happen in the second half of the season. So we have a lot of points to fight for. Our team always continues trusting in the way we play and the things we do. You maybe remember last season, when we had just five games left and knew that we had to win them? We did it. I don't know what psychological impact it has on other teams, but in our team we always fight to the end and are never beaten until mathematics say you cannot win." We all know that once we come out the other side of the Christmas and New Year period, we will have an idea of where we are compared to our rivals. It's interesting to hear Pellegrini talk of the way they won the league last season and the psychological impact they had on us and Liverpool. This bloke needs to wake up and realise that if it wasn't for Chelsea and Crystal Palace, they would not have won it! Pellegrini can try and put pressure on Mourinho as much as he wants but we ALL know when it comes to mind games - there is only one winner! Let's just put all talk of the title on hold until April at least!